The Square Tower at the bottom of the High Street is believed to date from the time of Edward III, who first ordered the town enclosed. In the early Tudor days it served as a residence for the Governor, and after that the official was provided quarters in the old "Domus Dei" the tower was then converted into a powder magazine. In the early years of the 1800s there was an introduction of a semaphore on top of the square tower, but with the introduction of the electric telegraph the semaphore was no longer needed and was demolished in 1848. The Royal Yacht Squadron then tried to secure the Tower for a Club House but without success. The above picture is a photograph of the Square Tower. A gilded lead bust of King Charles I can be found on the outside of the Square Tower. 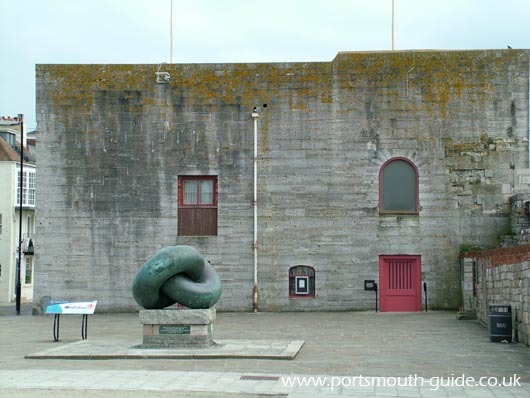 The bust was presented to the town in 1635 and commemorates his safe return to England in 1623.
Who ever controlled the point controlled Portsmouth Harbour so it was here that the first permanent defences were erected, in 1418 the Round Tower was erected but on plans of the time it is seen as King Edwards Tower. 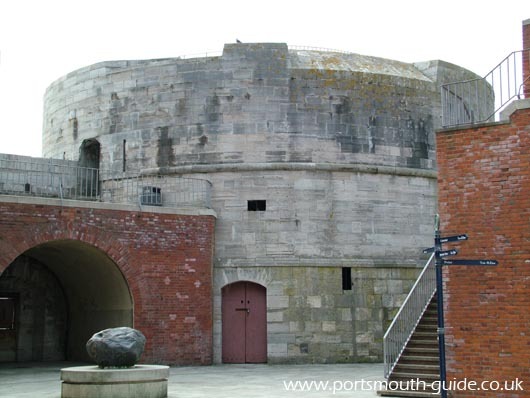 The long vaulted casemates that today face the parade were known as Eighteen Gun Battery. Henry VIII first established a battery here during the invasion crisis of 1545. The outer wall which can be seen today dates from the late 1680s and is the work of King Charles II's chief engineer Sir Bernard de Gomme. The photograph below is of the Round Tower. In front of the Round Tower is a rock that was brought back to Portsmouth on board HMS Hecla. The inscription on the rock reads "During the Russian War (1854) a landing party from HMS HECLA was attacked by a large body of Cossacks and many would have fallen had it not been for the courage of two sailors who taking cover behind this stone kept the enemy at bay until the safety of the whole party was assured. Captain HALL had this boulder carried to his ship and transported to Portsmouth. " Originally the 18 gun battery was a single story building and much narrower than it is today, backing on to a row of houses where the parade ground now lays. To gain access to the beach de Gomme built a small "s" shaped sally port in the wall at the south end of the battery, where the moat ran across the road. Between 1847 and 1850 the buildings between the battery and Broad Street were demolished and the ground used to build Point Artillery Barracks. The Round Tower was heightened and another tier added to the flanking battery to house 32 pdr cannons, while the rest of the battery was rearmed with 68pdr carronades on traversing mounts. In the early 1960s Point Battery and Barracks were sold to the City when the Coast Artillery was abolished. Now during the summer there are local artists who sell their paintings under the arches. There are also a couple of monuments. One is The Bonds of Friendship by Australian sculptor John Robinson. It is there to show the bond between Portsmouth and Australia. It was from Portsmouth in May 1787 the first ship sailed to Australia from Portsmouth. The Fleet sailed from Portsmouth to Botany Bay. The Bonds of Friendship monument is similar to one that can be found in Australia and was unveiled by the Queen in July 1980. The above picture shows the Square Tower with the Bonds of Friendship sculpture in front of it. The Point in Old Portsmouth is very close to all ships entering and leaving the port and so its a good place to watch the ships, here was a good place to watch HMY Britannia when she entered her home port.